Lock in a great price for Fairways Holiday Accommodation – rated 8.9 by recent guests! So much to do for young kids. Everything is close together. Naturally the view was breathtaking and the staff was exceptionally friendly and helpful. The cleaning lady Mpume and her helper did an excellent job in maintaining the property. Staff excellent knowledgeable and attentive. Cottage kept immaculately clean for us and well equipped. Sadly being an 8 sleeper space was tight. Kitchen very tiny and because of large tables required for 8 the verandah and dining area are very cramped leaving no space to “spread out and relax”. Rather bad leak from roof into kitchen - reported to reception. Overall excellent however - will happily go back. The activities for the kids. Chalets were clean and comfortable. Staff were always ready to help. Beautiful surroundings, clean & well equipped accommodation. Friendly & helpful staff. So much to do for young & old. Felt like an “all inclusive” resort - plenty of on site activities, amongst a stunning location - very few resorts can beat this setting. Facilities neat and well managed. Great service, food and coffee at the Bistro above the hotel. The place and location was awesome. Family friendly with lots of activities for the kids. Enjoyed it! The unit was so comfortable with everything we needed. 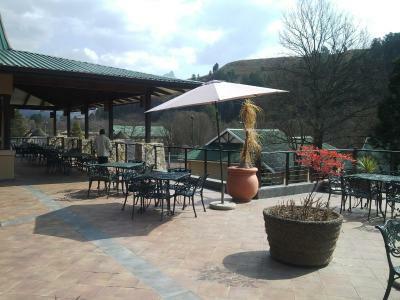 Located 21 mi away from Underberg, Fairways Holiday Accommodations is set within the Drakensberg Gardens Golf & Spa Resort, bordering the Drakensberg World Heritage Site. 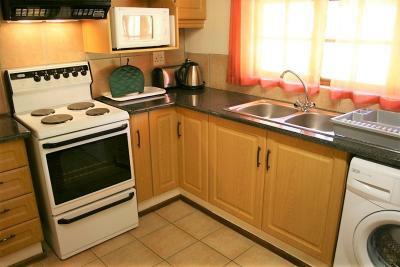 The well-appointed self-catering chalets come with a fully equipped kitchen, including microwave, oven, washing machine and tumble dryer. There is a TV and fireplace in the lounge and barbecue facilities on the patio with views towards the mountains. Restaurants and pubs are located on-site and there is also a mini-market. Guests at Fairways Holiday Accommodations have access to the resort facilities and activities for a fee. the resort features an 18-hole golf course, a spa and wellness center, an outdoor pool, a tennis court and a children's playground. Other activities offered include mini-golf, table tennis, fishing, horse riding, hiking trails, billiard and darts. When would you like to stay at Fairways Holiday Accommodation? Many guests return every year to The Fairways. It is a popular family resort which caters for all ages. House Rules Fairways Holiday Accommodation takes special requests – add in the next step! Fairways Holiday Accommodation accepts these cards and reserves the right to temporarily hold an amount prior to arrival. See above - verandah particularly cramped. If I complain about anything it will just be petty whining......some people just like to do petty whining. I don't do that unless there was a big issue. The place is awesome. Tennis courts condition is bad. Put put area is really untidy. The golf clubs available for hire are really poor as are the trout fishing rods. The roads are in poor condition. We had to pay for WiFi. Very small kitchen, patio table to big for patio. Beautiful surroundings, well maintained unit. They closed the activities for the kids like Archery etc. quite early at 3pm , the booking person at the Golf course was not too friendly and not accomadating at all , also a bit too many Baboons run onto the property , they cause a mess and look quite menacing. The venue and area is lovely.